Within The Methodist Church in the United States is a silent minority group. It is not represented in the higher councils of the church. Its members seem to have little influence in Nashville, Evanston, or on Riverside Drive. Its concepts are often abhorrent to Methodist officialdom at annual conference and national levels. I speak of those Methodists who are variously called “evangelicals” or “conservatives” or “fundamentalists.” A more accurate description is “orthodox,” for these brethren hold a traditional understanding of the Christian faith. Orthodox Methodists come in theologically assorted shapes, sizes, and colors. But, unfortunately, the richness and subtlety of orthodox thought are often overlooked and/or misunderstood. There lurks in many a Methodist mind a deep intolerance toward the silent minority who are orthodox. This is something of a paradox, because this unbrotherly spirit abounds at a time when Methodism is talking much about ecumenicity—which means openness toward those whose beliefs and traditions may differ. Yet it seems almost an intellectual reflex action to regard the orthodox brother as one who is ipso facto, narrow-minded, naive, contentious, and potentially schismatic. This familiar stereotype contains only a shadow of truth. Orthodoxy is more complex and more profound than its many critics seem to realize. Intellectual honesty—let alone Christian charity—demands more objectivity than the church now accords to its silent minority. Webster’s Dictionary tells us that orthodox means “conforming to the Christian faith as formulated in the church creeds and confessions.” These are Catholic, Lutheran, Reformed, and Anabaptist, which means that orthodoxy is the ultimate in ecumenicity. But what is orthodoxy? Actually, there is no mystique. We who are orthodox believe that the Christian faith is comprehensively declared in Holy Scripture and is succinctly summarized in the Apostle’s Creed. Here, we feel, is faith’s essence, doctrinally speaking. Orthodoxy in America has developed a theological epicenter known as the “five fundamentals.” These are by no means the whole of orthodox doctrine, as many people mistakenly suppose. Instead, these five points constitute a common ground for all who are truly orthodox. But beyond this common ground lies an enormous area of Christian truth where orthodox Christians disagree vigorously. Despite the broadness of orthodoxy’s doctrinal scope, one must examine the five fundamentals in order to understand orthodoxy’s Point of view. 1. Inspiration of Scripture. Orthodoxy believes with a passion that the whole Bible is God’s eternal, unfailing truth. Some portions of this truth are more important than others (Isaiah 5 towers above Esther, for example), but everything in the Scriptures has sacred significance. A thing is not true because it happens to be included in the Bible; we believe it is in the Bible because the thing itself is true. Orthodoxy believes that God has expressed scriptural truth through human personality, by the agency of God’s Holy Spirit. Perverted orthodoxy limits inspiration to the King James Version, as though God had somehow lowered it from heaven on a string back in 1611. Another unfortunate mutation of orthodox doctrine is the idea of mechanic dictation: that human beings were nothing more than stenographers, recording mechanically every jot and tittle that was dictated from above. Second—Acting through translators, redactors, and canonizing bodies, the Spirit has preserved Scripture from significant effort during the long and torturous process of transmission, right down to the present moment. Third—The Spirit enables believers to get God’s intended meaning from Scripture. To properly understand Scripture without the Spirit’s illuminating inspiration is no more possible than for an airplane to fly without wings and engine! This is why pure orthodoxy considers invalid any hermeneutic which disregards or minimizes the Spirit’s threefold work of dynamic inspiration. 2. The Virgin Birth of Christ. We believe that our Lord was, literally, “conceived by the Holy Spirit, born of the virgin Mary.” This must be true, or it would not have been written and transmitted in Holy Scripture. Naive? If so, we who are orthodox accept the label—along with such naive men of faith as the authors of Matthew and Luke, St. Augustine, Martin Luther, John Calvin, and our own John Wesley. We do not believe in Jesus because of the unusual circumstances surrounding his entry into the world via Incarnation. On the contrary, our experience of Christ’s lordship teaches us empirically what Scripture tells—that the entire realm of nature is subject to His sovereign authority. Therefore, Christ is not subject to known limitations of “natural law.” Order and unity and coherence for the entire cosmos center in Christ. Believing this about him, we logically believe that our Lord could be virgin born—just as the Bible reports. 3. The Substitutionary Atonement of Christ. What happened on Calvary is a mystery which can never be adequately explained by theories and/or analogies. Scripture seems to justify several explanations of the Atonement. In trying to fathom this mystery of mysteries, the theologian is something like an engineer trying to locate the main channel of the Mississippi River at flood stage. The river is two miles wide, but careful examination reveals what undoubtedly is the main channel of the river. 5. The Return of Christ. Orthodox Christians hold various views of the Parousia’s place in the order of last things. But all truly orthodox believers agree that Jesus Christ will return physically to “judge the (living) and the dead.” We do not regard the Great Assize passage (Matthew 25: 31-46) as parabolic teaching; instead, we believe it is a literal foretelling of the future judgment which Christ will execute when He comes again. Perverted orthodoxy has made an illusory religion out of millennial speculation. This clearly ignores Jesus’ teaching that the time of His appearing is known only to the mind of God. Jesus did not intend for His disciples to dawdle with date-setting. We are not to waste time peering into the sky waiting for a homecoming Hero to solve the world’s problems! Orthodoxy clings with joy to the “blessed hope” of Christ’s physical return. This expectation strengthens us for the living of these days. One of the most pronounced characteristics about authentic orthodoxy is its vibrant sense of eschatological expectancy. This is God’s gift to those, who cling to the “blessed hope” as we live in the eschatological twilight zone, between promise and fulfillment. How many orthodox believers are there among the people called Methodist? Probably there are quite a few. The evidence is elusive, but several clues bear examination. For one thing, more than 10,000 Methodist churches are using some Christian education materials based on orthodox theology. These materials do not come out of Nashville but from Elgin and Wheaton, Ill., and Glendale, Calif.
Theology is not the only reason why the wide-scale defection exists (price, service rendered by the publishers, and educational methodology are all significant factors). But theology cannot be dismissed by thoughtful Methodists who ponder the matter. The tenacity with which so many Methodists cling to non-Methodist literature strongly suggests the existence of an orthodox stratum down at Methodism’s grass roots. Another clue was unearthed during preparations for our new Methodist Hymnal. Surveys of musical tastes showed a powerful desire for those “good old” gospel songs. Of course there are various reasons for this. One of the most important is that gospel music emphasizes strongly the five fundamentals, which the Gospel likewise emphasizes. One reason for the persistence of gospel music is the people’s persistent interest in the Gospel. What is orthodoxy’s future within The Methodist Church? Persecution is not impossible, for just recently a high official in Nashville was heard to declare, “We are going to stamp out the last vestiges of fundamentalism from The Methodist Church!” Within the author’s lifetime, a Methodist bishop threatened to drive from his conference any man who affirmed from the pulpit Christ’s Second Coming. More likely, however, is the objective prediction made by Dr. Paul Hessert, professor of historical theology at Garrett Theological Seminary. He foresees a continuing eclipse of orthodox influence within the seminary trained Methodist ministry. He also predicts that orthodoxy will continue among the laity—and, therefore, will remain strong among supply preachers. As to the hierarchy of the church, Dr. Hessert believes that the present liberal influence will gradually give way to the newer theologies, which represent an evolution of old-fashioned liberalism. Neo-orthodoxy will have a lessening influence, be believes. The reason is that neo-orthodoxy is essentially a compromise position, and its adherents tend to slide away—mostly toward the newer liberalism. Orthodoxy seems destined to remain as Methodism’s silent minority. Here lies the challenge: We who are orthodox must become the un-silent minority! Orthodoxy must shed its “poor cousin” inferiority complex and enter forthrightly into the current theological debate. We who are orthodox must boldly declare our understanding of Christian truth, as God has given these convictions to us. We must speak in love and with prophetic fearlessness, and must be prepared to suffer. But regardless of the consequences, we must be heard in Nashville, in Evanston, and on Riverside Drive. Most of all, we must be heard in thousands of pulpits, for the people called Methodist will not cease to hunger for the good news of Jesus Christ, incarnate, crucified, risen, and coming again. We must not speak as right-wing fanatics, intending to subvert the “establishment” and remake it in our own orthodox age. Instead, we must speak to our Christian brothers as Christian brothers, trusting that God will direct and prosper our witness to the truth as we see it in Christ Jesus our Lord. 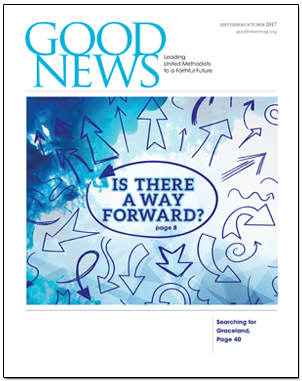 The late Charles Keysor was the founding editor of Good News. Reprinted from Christian Advocate, July 14, 1966. Copyright (C) 1966 by The Methodist Publishing House.